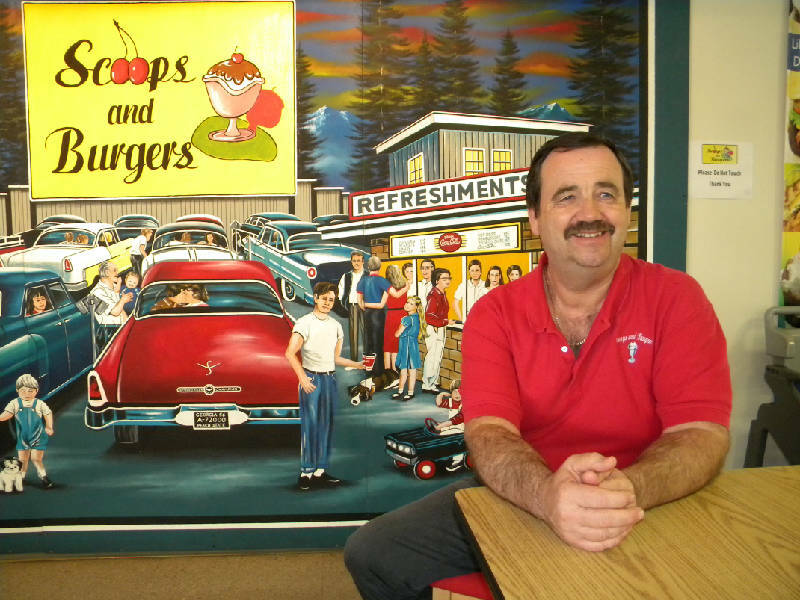 Frank Kolhouse, with a mural rearranged by one of his restaurant's fans, recreated an ice cream only Cleveland, Tenn., baby boomers knew about. CLEVELAND, Tenn. - One recent Tuesday evening, the ladies of the Red Hat Society were gathering in one corner of Scoops and Burgers. Gospel music groups were preparing to perform in another, and motorcycle fans were congregating outside. It's been a fun first year for his restaurant that opened last October on one of Cleveland's busiest street corners, Keith and 25th streets, Frank Kolhouse admitted. So when enthusiastic customers Ron and Debbie Moore suggested bringing back grape ice cream -- the kind they used to serve at Dooley's Ice Cream Parlor, the flavor former Cleveland kids now grown to a certain age remember -- Kolhouse thought about it. "If you want to know the truth, I thought they were crazy," he said. But he's from dairy country up north and was trained in the art of ice cream making in Chicago earlier in his restaurant career, so he gave it a try. With the old recipe in hand (tracked down by the Moores) Kolhouse took about three weeks to experiment with the flavor combination. Who knew you needed a little pineapple to bring out the grape flavor? Kolhouse, who is proud of his entire menu and is looking for a hot slaw recipe, can talk as long as he needs to about food quality, including all those other ice cream flavors. But grape? "It's my biggest seller," he said. "It wouldn't sell anywhere else, I don't think. But it does here. I can tell when somebody comes in if they are from Cleveland." Dooley's Grape is even prominently displayed on the sign out front. Dooley's, which was on Central Avenue, went out of business in the 1970s. "Well, I was always more partial to their [Dooley's] vanilla," Ron Moore said. This story was edited on Sept.15, 2012. the location of the old Dooley's Ice Cream Parlor was incorrect.